Secrets of Shakespeare's Grave by Deron R. Hicks. Review: Fast paced action, adventure, and mysteries. If you like these kinds of books, you came to the right place. Secrets of Shakespeare's Grave, by Deron R. Hicks is the right book for you. The main character of this spectacular book is Colophon Letterford. 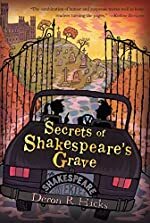 In Secrets of Shakespeare's Grave, a business named Letterford and Sons is burned down. A tall, bald and thin man named Treemont gives Mull Letterford, the father of Colophon until Christmas Eve to get enough money to pay for the failing company. Treemont has always been jealous of Mull's accomplishments and has always wanted to steal the company from him. If Mull cannot get enough money by Christmas Eve, Treemont will take the company over. Colophon tries to save her Dad's business with Julian, Mulls first cousin. In order to save it they become involved in a mystery. When Colophon and Julian solve some of the clues, one of the clues tells them that the next clue is in Stratford-Upon-Avon, which is just outside of London. Colophon's mom is going there anyway to start planning for the Christmas party, so Colophon and Julian will go with her. While Colophon and Julian are at Stratford-Upon-Avon, Mull Letterford goes to a meeting with an author, Roger Scornsbury. Treemont knows about the meeting so he tries to mess the meeting up and he knows exactly how to do that. Roger has a phobia of balloons and Treemont orders balloons for Roger. Luckily, Case is there to try to stop the people from getting to Roger, but there are too many people delivering the balloons and they get past Case. When the people get the balloons to Roger he freaks out and flees out of the building. Fortunately, he has two more meetings to go to. The next meeting is also with an author, Patrick O'dally. The strange thing about Patrick O'dally is that he has to have breakfast, lunch and dinner at the same time, at the same table if going out. The problem is that Treemont also knows the author's habit and tries to make Mull late to the meeting. Mull hires someone to clean his shoes and Treemont knows someone who has a chemical to put in the shoes that when the person's feet start to sweat, the shoes will give off a horrible stench. Treemont hires the person to put that chemical in Mull's shoes. When Mull gets the shoes back he thinks he thinks the person did a great job cleaning his shoes. At the hotel they are staying at Mull realizes the time and quickly has to go. While he is rushing to get to the meeting he starts to sweat and the shoes start to stink. When Mull is driving Case notices the smell and dogs are chasing the car. He tells Mull to try to lose them, but can't. They get out of the car and start running. They are not able to lose the dogs and see a boulder. They rush to get up the boulder, but the dogs are able to get up it also. Their only way is to go through a forest. When they get to the restaurant they see Patrick waiting but leaves because they were only a few seconds late. The next author rejects publishing because apparently, someone videotaped their experience and the author saw it. Colophon and Julian uncover clues about the location of the treasure. They find a key that they believe is for a bank lockbox. Will the key open the box? Will Colophon and Julian find the treasure in time to save the company? If you read this book, you will know all of the answers. Overall, I enjoyed reading Secrets of Shakespeare's Grave. I did because I am a person who likes reading mysteries and this is one of my favorite books. It was one of my favorites because it was full of suspense. I wanted to keep reading to find out what was going to happen next. One thing I wished there would have been was more humor because it would have made the story not as serious. All of the characters were serious. I thought the names of the characters were interesting also. They were not common names. The setting does not really go with the story because the setting was close to Christmas and it is a time when you are happy and it is not supposed to be a sad time. It is not happy when you lose a company. So if you are a person who likes mysteries, you will love this book. To me, this book deserves five stars because the story doesn't slow down or get boring. It gets more and more interesting every page. We would like to thank Houghton Mifflin Harcourt for providing a copy of Secrets of Shakespeare's Grave for this review. Have you read Secrets of Shakespeare's Grave? How would you rate it?